A sabbath day is common in many faiths. I try to observe a day of sabbath once a week. As is typically the case for Christians, I observe the sabbath on Sundays. I make a point to do nothing with regards to housework, eating out, or shopping. I focus on hanging out with my family, having personal quiet time, and/or going to church/bible study. My main goal on Sundays is to ‘be still’ and thank God. However you spend your Sunday, I hope you make time to ‘be still’. Enjoy the stillness. There is far too little of that in our world. Coffee is always tastier, I believe, in a beautiful cup. That was a delightful cup of coffee, too, K8. 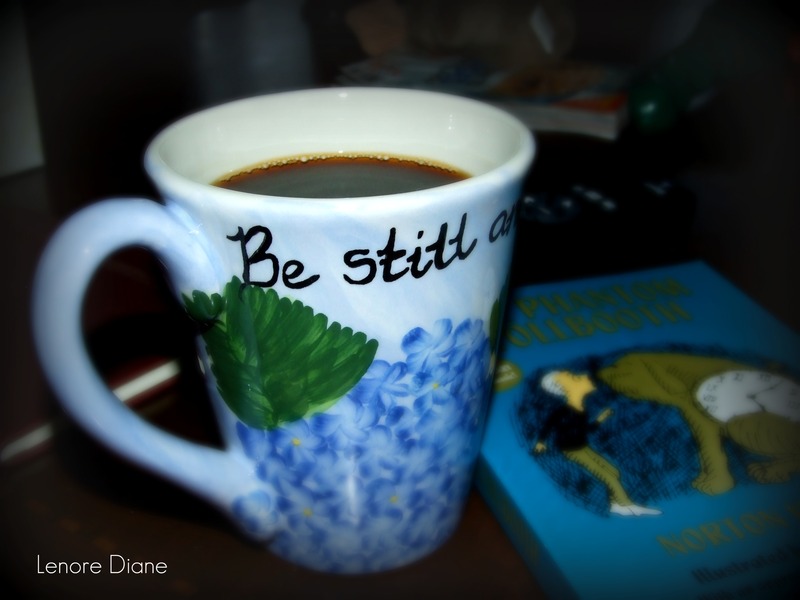 I hope you were able to find some stillness in your day, as well as enjoying a nice cup of coffee. Thank you for visiting and sharing a cup with me. Being still and enjoying my coffee right now, too, LD. Both the boys have (shockingly) slept in past Li’l D’s usual 6 a.m. waking time, so I’ve savored some quiet myself this morning. I’m trying to get into observing shabbat again myself; I didn’t do so well this week, but there’s always next week (one hopes!) to do better. Oooooh – sleeping past 6’am. Nice! I hope you allow yourself shabbat time, Deb. I really believe quiet time does a body (and mind) good. Every day is a new opportunity to try again. Here’s to finding stillness! I think everyone should have a time out day, it can certainly be a “real pick me up” I feel, and if possible a bit of time just for yourself. Hello Mags – Time outs are a wonderful treat, I think. I have really enjoyed deliberately taking time off on Sundays. I find I look forward to Sundays more, and I am better prepared for the week ahead. Cheers! I agree whole-heartedly. Sunday is a day to focus on God and family. And a great cup of coffee in my favorite mug helps get the day off to a great start. I’m enjoying your photos. I love my Sundays, Susan. I really, really do. And I truly believe the focus and stillness makes the week ahead a better week. I am grateful for having God in my life. I have a greater appreciation for all that is around me, I think. Thank you for visiting. I am glad you are enjoying my photos. Had I been able to include the whole line, I would have done it, Mel. You certainly got the phrase right! I was certain the ‘still’ would speak for itself. Thank you for visiting! My oldest and I are finishing up Charlie and the Chocolate Factory, and then I hope we will start The Phantom Tollbooth. I am super excited about it. He may want to read Charlie and the Glass Elevator next – but I’m pushing for Phantom!! It’s great to hear of people who stop the chaos, the clutter and the clatter – to just be with one another. Good for you, Lenore. Thank you, Amy. The fact that ‘being still’ is scheduled makes it easier. I feel as though I am granted permission to stop. Silly, eh? As always, thank you Arindam! That cup looks so inviting! I hope you had a wonderfully still Sunday, Ms. D! The coffee was extra tasty, too! I did have a delightfully ‘still’ Sunday, SIG. I hope you had a nice one, too.